The Iranian government has declined to permit a delegation of U.S. congressmen into the country to monitor the Islamic Republic’s compliance with last summer’s nuclear agreement, informing the lawmakers in a sharply worded letter that no U.S. persons are permitted under the agreement to monitor Iran’s compliance, according to a copy of the communication obtained by the Washington Free Beacon. Iran informed three leading members of Congress in a letter sent to the State Department last week that their request for travel visas into Iran will be denied on the grounds that no U.S. citizen or official has the right to inspect Iran’s contested nuclear sites, according to a copy of Iran’s response letter obtained by the Free Beacon. Reps. Mike Pompeo (R., Kan.), Lee Zelden (R., N.Y.), and Frank LoBiondo (R., N.J.) have been trying for months to obtain travel visas to Iran so they can meet with American hostages and inspect Iran’s nuclear sites to ensure compliance with the nuclear accord. Iranian officials stalled the effort for months and missed their own self-imposed deadline by which they vowed to respond to the request. On June 2, Iranian officials officially informed the State Department they are denying the travel request, according to the letter. "Despite what you seem to presume, members of the U.S. Congress do not get to dictate the policies of other countries," the Iranian Foreign Ministry wrote in a letter. "This clearly applies to Iranian visa policies. Bear in mind that as members of the U.S. Congress you are not a global authority." 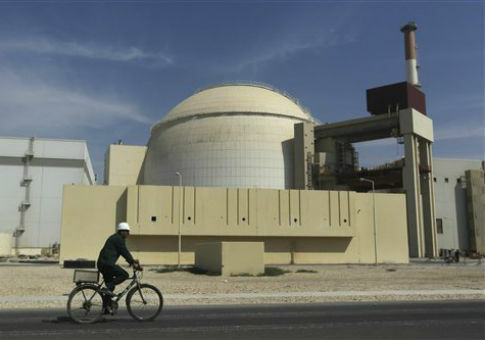 Iran is not permitting any participant in last summer’s nuclear agreement to inspect the country’s nuclear sites to ensure compliance with the deal. "No [deal] participant, including the United States, and certainly no citizen or official of these countries, can arrogate any such right to monitor the implementation of [Joint Comprehensive Plan of Action] to itself, nor are they authorized by the JCPOA or other provisions of international law to encroach upon Iranian sovereignty by claiming such monitoring authority," Iran maintained. "In sum," the letter continues, "we consider your visa request to have been a publicity stunt and not an appropriate request to visit a sovereign country; and it has, and will continue to be, treated in that spirit." Pompeo, a member of the House's intelligence committee, told the Free Beacon on Tuesday that he will continue to pursue his efforts to travel to Iran. "This letter from Iranian Foreign Minister Mohammad Zarif is entirely divorced from reality," Pompeo said. "My two congressional colleagues and I followed all the necessary procedures—filling out applications, writing letters, meeting with staff, following up on the status, and even hand delivering our materials to the Iranian Interests Section—and still the Iranians refuse to reply in a civilized or respectful manner." "After being designated by the U.S. Department of State as an official state sponsor of terrorism since 1984, the Islamic Republic of Iran continues to act as a rogue and hostile nation. I ask the Iranian government again—grant me a visa," the lawmaker said. The letter sent by Iran was forwarded by the State Department to three Congressmen. A State Department spokesman told the Free Beacon on Tuesday that it does not take a position on Iran’s rejection of the visa applications. "We’re aware of the Iranian response to visa applications by some Members of Congress," the officials said. "The response came to us and we passed it along to the Congress members. We have no specific comment on the Iranian response to the members of Congress." "As we’ve said in the past, given that we have no ability on the ground in Iran to support a congressional delegation, and given the recently updated Travel Warning, we had and continue to have no plans to intervene in the request by these Members for a visa to Iran," according to the State Department official. Iran emphasized in its letter that the United States and Iran still do not have friendly relations. "It bears reminding that Iran and the United States do not have diplomatic relations, and as such, there are no reciprocal monitoring arrangements between the two countries," Iran writes. One senior congressional aide informed about Iran’s denial told the Free Beacon that the Islamic Republic’s behavior "does not bode well for the future of this nuclear deal." "As a state sponsor of terrorism, Iran’s undated, unsigned, and unserious letter is proof of its obviously hostile attitude," the official said. "One would hope that the Iranians would act as a civilized nation when dealing with elected officials of the country that is providing billions of dollars in sanction relief." "But that is not the case, as this letter, and Iran’s actions demonstrate," the source continued. "If the visa applications of Congressmen Mike Pompeo, Lee Zeldin, and Frank LoBiondo are so offensive to the Iranian regime, the regime should just reject them. To play games with these elected officials, two of whom are veterans, does not bode well for the future of this nuclear deal and U.S.-Iran relations."